The Homeschool Lesson Planner is a type of V Planner. This planner manages lesson plans but it does not manage grades. If you do not keep grade records or if you use something else for grade records, then this is the right V Planner for you. Without the grade system, the Homeschool Lesson Planner is the easiest V Planner to set up and to use. An s-sheet is pictured here; click to see the full size image. The Homeschool Lesson Planner does not keep grade records, if you need grade records, use the V Planner or use a different method for grade records. Additional information is below the video. Setting up the Homeschool Lesson Planner is very much like the V Planner with a few exceptions and so when using the V Planner V4 setup article as your guide, ignore the parts that are related to other courses, grades, terms, and split s-sheets because this planner does not have those items. 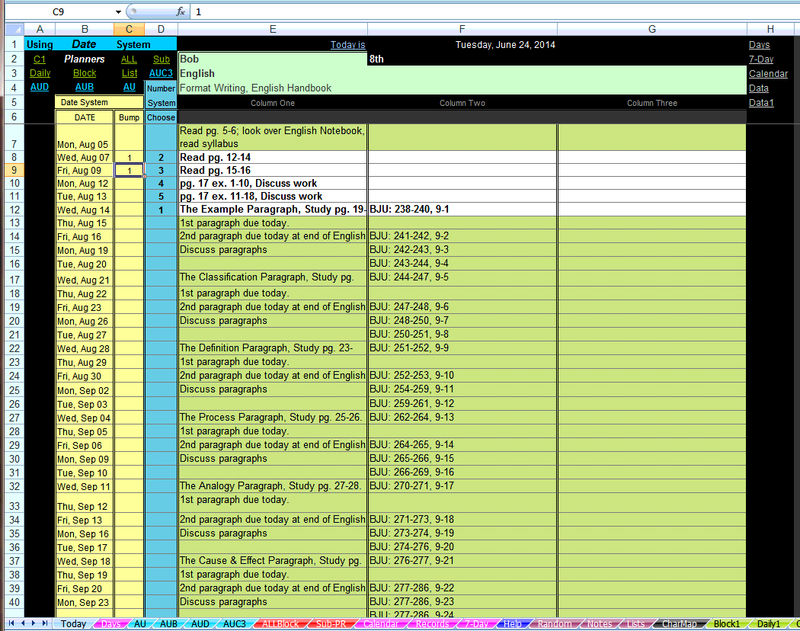 Enter lesson plans at the subject sheets (s-sheets). In order to take full advantage of any V Planner, one needs to understand how the two lesson plan fetching systems work. Below I have linked three videos that show how to use the Number System and Date System. Because the Homeschool Lesson Planner V4 is based on the V Planner V4 , then some V Planner V3 and non-grade related V4 help files apply. Ignore the parts that are either absent or different.